Stacking bracelets is becoming an 'art' but stacking rings is even better. It looks so indie and bohemian. Without having too much shiny 'bling' going on. They're subtle but a statement. I love them! What do you think? I need a few more dainty ones but for now, I just like wearing a double stack on my pinky. I found a few of online from some gorgeous jewellery stores. Dixi and another store called Kukee. They are really cheap too from £1.50 - £4. So cute, I love my little rings! I'd love to! Thanks Francesca! I don't have any of these yet but I definitely want to rock them a la Rihanna. I have large fingers so could probably get away with buying small rings! 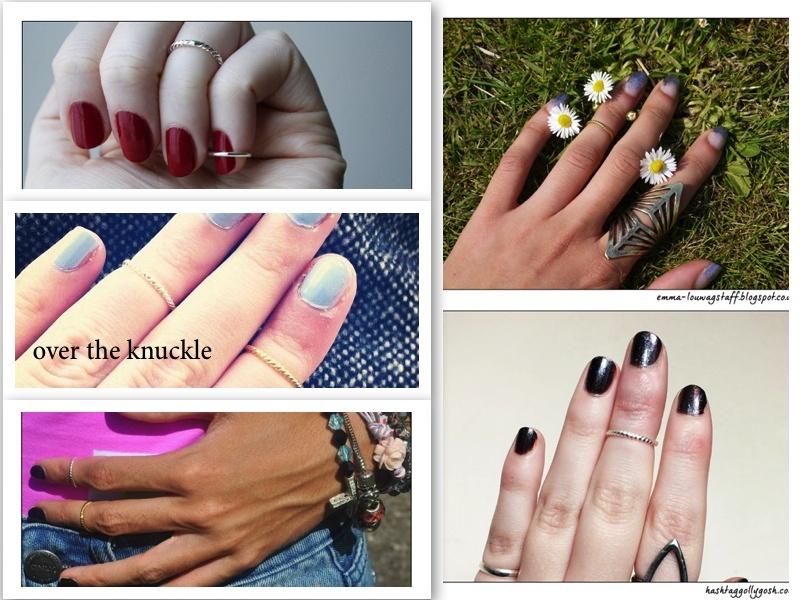 I love the look of delicate rings! Above the knuckle looks really cool. i need to get some of these rings they're so cool!! I have some stacking rings from H&M which I love, they're great for switching around :) I love the colour of your nail polish too! love wearing multiple rings! great post. Thank I'd love to! I'll have a look! Looking to buy these type of rings now..Also what nail polish is that blue one? Love it! Thanks, Its Royal Court by Nails inc! I love the way of wearing multiple rings.Nice nail colors! Thank you! Nails inc never fails!